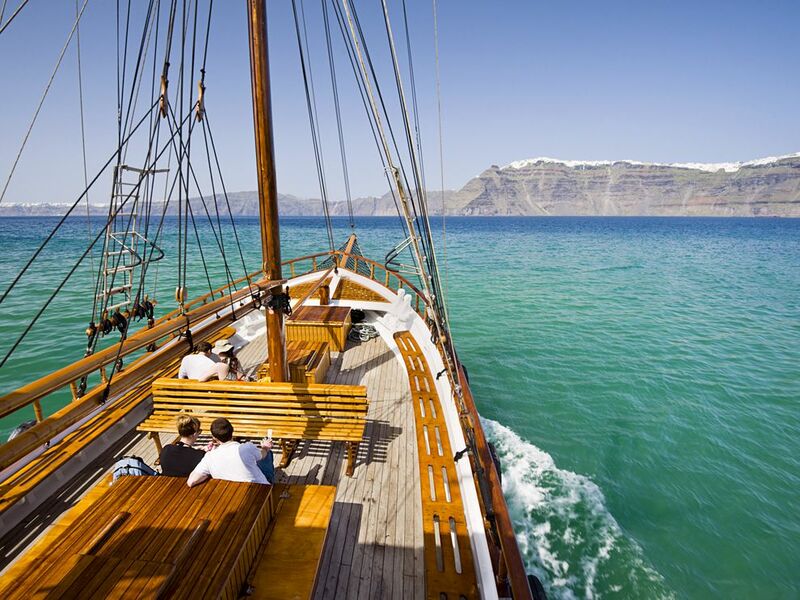 A tour to the islands of caldera with low cost is our trip with a traditional boat. 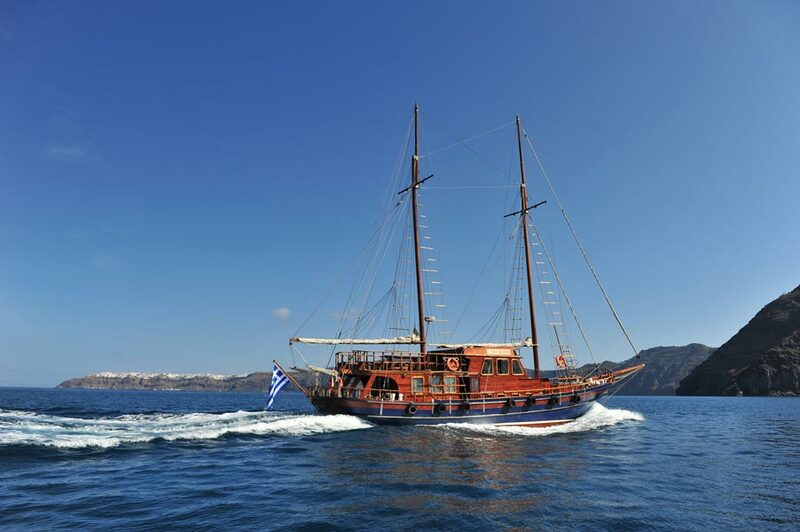 It departs from the old port in Fira at 10:45 with destination the Volcano, a distance of just 10 minutes from the bay of Fira. Your stay there is for about 1 hour and 15 minutes. To walk up to the volcano to meet the active craters is about 20 minutes through a walkable path. It is well worth to reach the top. That is because when you arrive there, if you scratch the surface you will see steam coming out. Also, here you can smell the sulfur and take pictures. 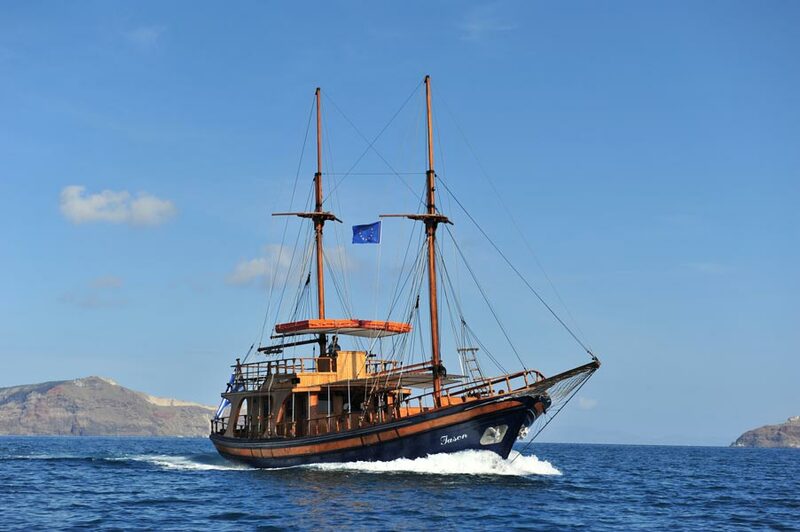 After the visit of Nea Kameni, the boat continues to the island of Palaia Kameni where the Hot Springs are located. The boat anchors a few meters outside the small bay of Agios Nikolaos. There, it lowers down a ladder in the water and from there you can swim a distance of about 30 meters to get to the famous mud baths of Palaia Kameni for which are believed to have beneficial abilities for the skin and other diseases. The water temperature is 30-35 degrees but it constantly mixes with seawater. The boat remains here for about 30 minutes for swimming. It’s quite a time since there is no beach on the small island where you can stay for a while. 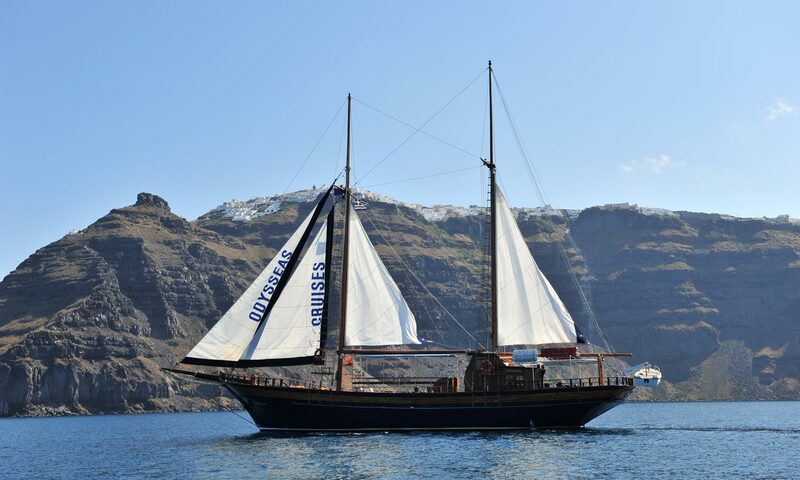 In continuation of the tour, the boat sails to the island of Thirassia. You have 2 hours free time to swim in the crystal waters of Korfos. Alternatively, you can eat in traditional taverns with different dishes of the island. You can go on foot or by donkeys in the village of Manolas, which is very picturesque with narrow streets and nice view to Santorini and worth a visit. After the 2 hour pleasant break on the island of Thirassia, we start to return back to the old port sailing near the volcanic cliffs of Oia to take pictures of the unique scenery.